Oh No, My Kitchen is Like a Doll's House... Now What? Can you believe it is the last day of the 31 Day Challenge? It has definitely taken some effort but I wrote a post for all 31 days of October! (Success image above from http://www.sacredcirclecreativelife.com/uncategorized/the-wisdom-in-risk/) I am definitely the kind of person who takes commitments seriously and if I put my mind to it, I am going to do it. So here we are 31 days in. Thanks so much for reading and supporting me in the endeavor. I love writing this blog and am so appreciative that anyone reads it. I hope I will have comments soon so you can tell me what you think. So, thanks and success aside….what can you do to make the most of a small kitchen? Having a nice place to cook is definitely incentive for getting in there and cooking for yourself. Small space, bad lay out, no equipment....all are deterrents to cooking. The photo above is the kitchen in my last house. (Unfurnished as this is the day I moved out.) I did love that house, and this open kitchen that flowed into the family room was just the best. I had plenty of storage and counter space and a gas stove. A double sink and a vegetable sink. And water and ice in the door of the fridge! A real cooks kitchen. And then I moved to Austin to my little apartment….. This is looking into the kitchen from the living room. You can see it is really small. I have one full sized drawer. And two accessible cabinets plus the two over the stove and the fridge. (I don't count the cabinets under the sink.) Not much counter space either. I have a really skinny drawer and cabinet by the sink, but the cabinet only fits a sheet pan and the drawer really fits nothing! I cram towels in there. I have a cabinet in the dining room (a room I use as storage and a utility closet) that I assume is the pantry. It is rather odd with four shelves that are not really aligned with the two doors. And that is it. I miss having an ice maker and I miss having space to really cook. And don't even get me started on cooking on that old electric stove. So complaining aside, I decided to make the best of it. It is only 9 months after all. Here are a couple of things I came up with to maximize my space. I think these are worthwhile even if you have a nice big kitchen. With only one drawer, I use it for silverware and have nowhere to store my knives. So I got a double sided magnet knife strip. 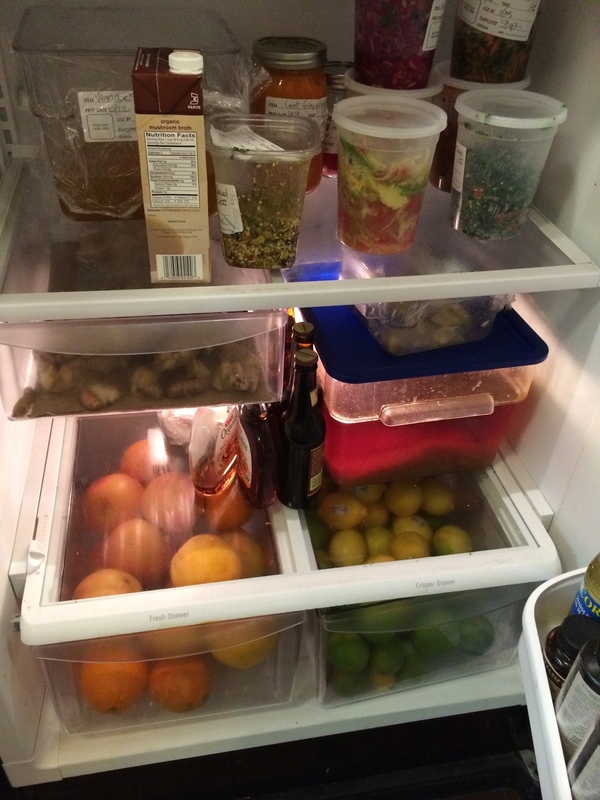 One magnet sticks to the side of the fridge and the other side holds the knives. Perfect! They are out of the way, yet easily accessible. To make more counter space, I got a cutting board big enough to fit across the sink. I only need one sink for water while I cook and this gives me some extra work space. It makes a huge difference just having this bit of extra surface to put things on. It is not very stable and thus not great for cutting, but it still really helps! For my pantry it is hard to know what is in there. I had to stack lots of things and I have flours and dry goods in plastic zip lock bags to save space, and I just can't tell what I have or where it is. So I did a little inventory and wrote it on a paper that I posted inside the cabinet door. There is a sheet for the upper cabinet and one for the lower cabinet. The pictures are a little hard to read here but it is easy in person. Now if I am planning for a recipe I can look at the door and see if I have what I need. You just have to remember to adjust the list as your inventory changes. I also grouped like items together. So sugars together, flours together, rices and grains together. It is easy! Even at school we have a small pantry area and keep items together by type. Everything is labeled individually as well as the shelf areas are all labeled. See the pictures below. The fridges are the same way. Citrus all together, miso together on the top shelf, herbs together, eggs and dairy together etc. 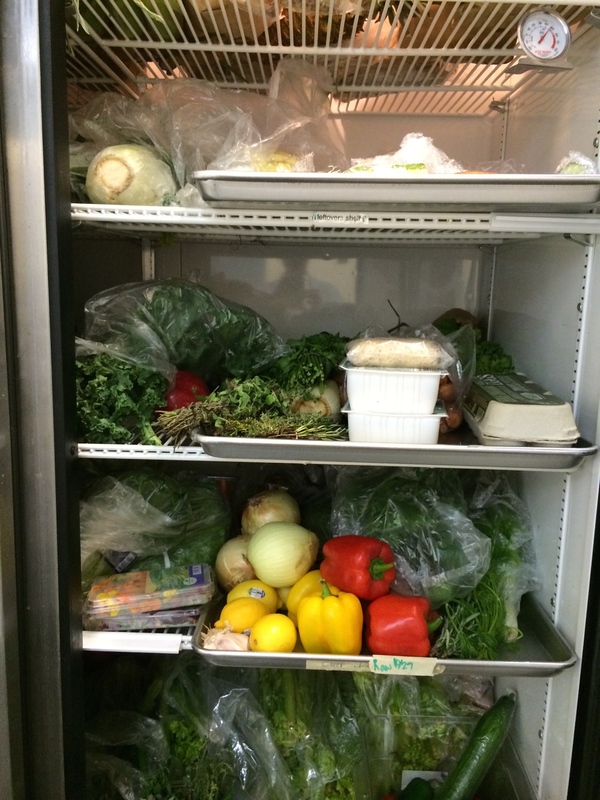 It is really helpful especially because we have multiple refrigerators and it would be hard to find things otherwise. I also keep utensils I use often on the counter by the stove in containers. I don't have drawer space to keep them elsewhere, but it is also nice to have them handy. Since I sent all my belongings to storage (thanks, Mom!) I don't have a nice crock to put them in and I don't want to spend money on things like that. So I used a can that a jar of mustard came in, and a big tomato can. I actually like them! The little bowl in front is filled with salt. I like to have it readily available for measuring or to use by the "pinch" so this works great. I am going to Houston for the weekend to celebrate with Tom's family as his son got married in September. They eloped so we are having a party... After 31 posts I am going to take a couple of days off. I'll see you on Monday! Have a great weekend.